August 3, 2017 (Tony Cartalucci - LD) - London-based voting machine maker Smartmatic claims the recent polls carried out in Venezuela this week were rigged. In their 5 minute video statement, however, they failed to provide any evidence. The number of Venezuelans who participated in the election for an all-powerful constituent assembly was tampered with - off by at least 1 million votes - in an official count, the head of a voting technology company asserted Wednesday, a finding certain to sow further discord over the super-body that has generated months of nationwide protests. Smartmatic CEO Antonio Mugica said results recorded by his systems and those reported by Venezuela's National Electoral Council indicate "without any doubt" that official turnout figure of more than 8 million participants was manipulated. Our automated election system is designed to make it evident when results are manipulated, however, there must be people auditing the system and watching for that evidence. During the National Constituent Assembly elections there were no auditors from the opposition parties as they did not want to participate. Thus, at best Mugica and Smartmatic can warn that irregularities might have occurred, since no one from the opposition was there to audit the final tallies and report any potential inconsistencies. Since no opposition auditors were there, no evidence has been provided that such irregularities occurred. Neither AP's article nor Mugica's full statement provide any evidence or explanation as to how Smartmatic "estimated" the final count regarding participation was off by "one million votes." Mugica doesn't even explain whether it was one million more than reported, or one million less. Smartmatic either failed to reveal information it has regarding the final count, or has simply lied on behalf of the Venezuelan opposition and the powerful foreign interests sponsoring it from Washington, London, and Brussels. This latest announcement, absent of any evidence to substantiate these accusations, calls into question Smartmatic's professionalism, ethics, and impartiality. 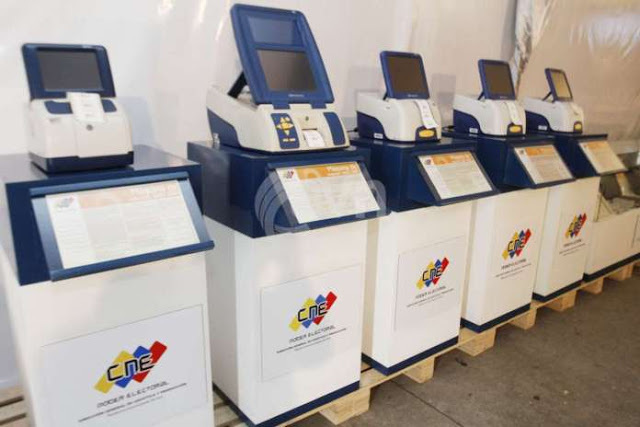 Other nations considering Smartmatic machines must consider the possibility that the company's CEO may attempt to use his machines and their role in tallying votes to manipulate their internal politics as well. This announcement also once again calls the Western media into question for failing to note the very obvious inconsistencies between Mugica's conclusions and the lack of evidence provided to substantiate them. July 31, 2017 (Tony Cartalucci - LD) - Venezuela's ongoing crisis is not driven by political ideology - it is not a battle of socialism versus capitalism or dictatorship versus democracy - it is the result of two centers of political power possessing opposing interests and colliding geopolitically. The nation of Venezuela is currently under the control of Venezuelans who derive their support, wealth, and power from Venezuela itself - its people and its natural resource. This political order also receives aid and support from Venezuela's economic and military partners both in the region and around the globe. 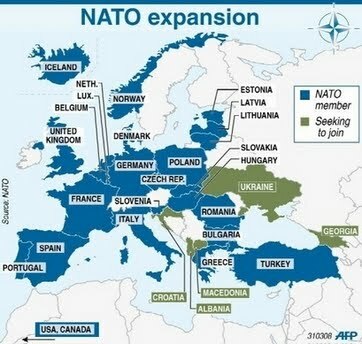 The opposition opposed to the current political order and seeking to supplant it represents foreign interests and more specifically, the United States and its European allies. The Opposition is Pro-Washington, Not "Pro-Democracy"
As early as 2002, US-backed regime change targeting then Venezuelan president Hugo Chavez, sought to violently overthrow Venezuela's political order and replace it with one obedient to Washington. 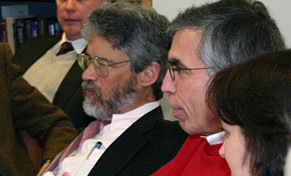 Current leaders of the opposition were not only involved in the 2002 failed coup, many are documented to have received political and financial support from the United States government ever since. Image: Maria Corina Machado, founder of Sumate, an alleged Venezuelan election monitoring group, funded by the US National Endowment for Democracy (NED), meeting with US President George Bush who presided over the failed coup attempt seeking to oust President Hugo Chavez. This includes several founders of the opposition party, Primero Justicia (Justice First), including Leopoldo Lopez, Julio Borges, and Henrique Capriles Radonski. The latter of the three has been prominently featured in Western media coverage lately. US State Department documents reveal that the department itself along with US-funded fronts posing as nongovernmental organizations (NGOs) have been providing Venezuela's opposition with support. This includes a report titled, "Status of Capriles and Sumate Cases," referring to the above mentioned Henrique Capriles Radonski and Sumate, a US National Endowment for Democracy (NED) funded front posing as an election monitor. Currently, NED's own website features an extensive list of activities it is engaged in within Venezuela's borders. It includes leveraging human rights for political gain, electoral manipulation, building opposition fronts, and expanding pro-opposition media. While each activity is labelled with benign titles, it is clear that none of these activities are done impartially, and as State Department documents reveal, these activities are done specifically for the benefit of the US-backed opposition. In reality, AEI is talking about dismantling entirely the obstacles that have prevented the US and the corporate-financier interests that direct it, from installing a client regime and extracting entirely Venezuela's wealth while obstructing, even dismantling the geopolitical independence and influence achieved by Chavez in Venezuela, throughout South America, and beyond. May 24, 2017 (Tony Cartalucci - LD) - The US media has been paying increasing attention to the unfolding crisis in the South American nation of Venezuela. As the US media has done elsewhere, it is attempting to portray the unfolding crisis as a result of a corrupt dictatorship fighting against a "pro-democracy" opposition. In reality, it is simply a repeat of US-driven regime change aimed at toppling Venezuela's independent state institutions and replacing them with institutions created by and for US special interests. The "opposition" is comprised of US-backed political parties and US-funded fronts posing as nongovernmental organizations (NGOs) many of which are listed on the US State Department's National Endowment for Democracy (NED) website. ...observers of the region point out that the US has a long history of seeking to interfere in the politics of Venezuela, as well as elsewhere in Latin America. To understand America's actual role amid Venezuela's unfolding crisis, one must read policy papers produced by organizations called "think tanks" which devise and promote US policy. The Brookings Institution is a Fortune 500-funded policy think tank. It is populated by policymakers who represent the collective ambitions of some of the world's most powerful corporate-financier interests including big-oil, defense, agricultural monopolies, pharmaceutical corporations, media interests, and more. 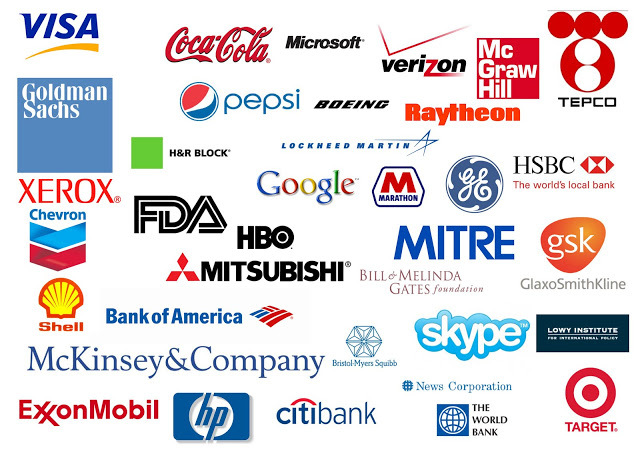 Image: Just some of the Brookings Institution's corporate-financier sponsors. 5. As a last resort, the United States could consider raising economic costs to the government through an expanded sanctions regime that aims to limit Venezuelan earnings from oil exports and block further financing. This policy is risky, given that the Maduro government would be able to more credibly shift blame for the economic crisis onto the United States, and should be accompanied by well-publicized efforts to deliver humanitarian aid through credible civil society and nongovernmental organizations. It is a prescription for further economic isolation, US-funded political subversion, and with its reference to "a transition to democracy," an oblique call for regime change. December 13, 2014 (Tony Cartalucci - LD) - Revealed in an Associated Press (AP) investigation, the United States Agency for International Development (USAID) had for two years attempted to create and exploit a social network within Cuba for the purpose of sparking unrest and overthrowing the Cuban government. The program was an abject failure, primarily because the Cuban government took the necessary measures to investigate, interrogate, and otherwise disrupt what was foreign-backed sedition. Far from the first time USAID and other US organizations claiming to be aiding in development but in fact engaged in political subversion, the Cuban program itself was based on another US-backed program used to topple the government of Serbia in 2000, AP would reveal. The USAID operation involved money covertly funneled into Cuba through front companies and offshore banks. USAID, despite the evidence, has wholly denied the operation, as has other US organizations caught in blatant political subversion. If by "civil society," USAID means networks of political subversion operating in the interests of Wall Street and Washington, then that is precisely what USAID was doing in Cuba, and does elsewhere around the world. However, USAID's insistence that none of its work was "secret or covert" is simply a lie. 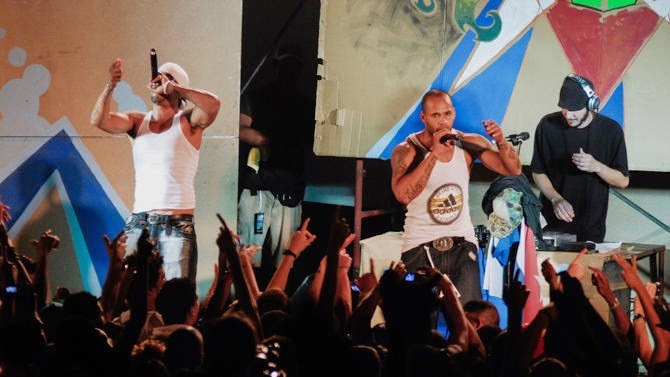 AP, in another report titled, "5 things to know about USAID's Cuban hip-hop plan," would reveal that USAID covered up its Cuban program under the guise of "health and civic programs." The same report would claim that USAID funding was hidden from the Cubans themselves involved in the program, adding an extra layer of duplicity and deceit. 1. The United States is engaged in political subversion around the world, disguised as "democracy promotion" and even development aid for "health and civic programs." 2. It carries out subversion covertly through front companies, proxies, and third-party contractors, then blatantly denies all allegations no matter what evidence is produced by targeted countries, or even Western journalists investigating otherwise undeniable evidence. 3. The US uses social networks, youth groups of musicians, students, and social media groups based on Facebook and Twitter to create the illusion of growing opposition where none exists or exists but constitutes an obscure minority. 4. 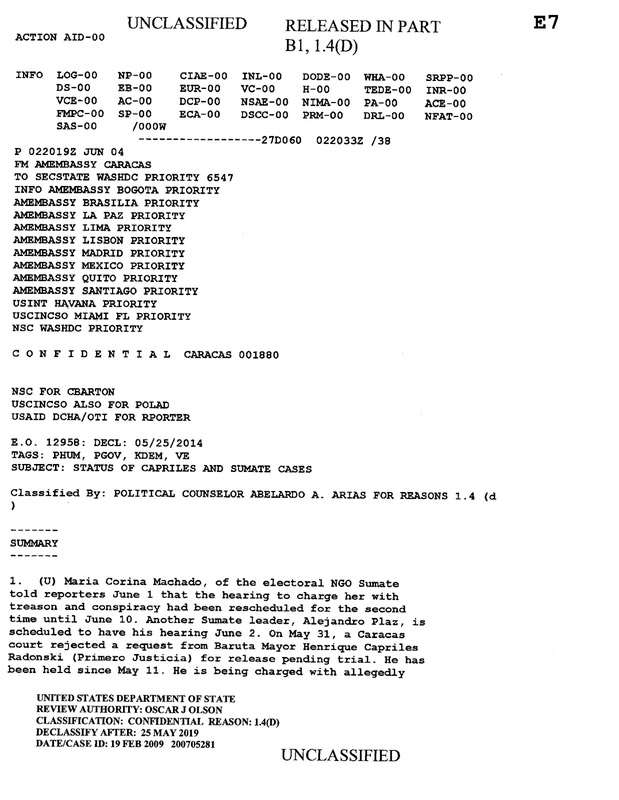 While the opposition movement engineered by USAID appeared oblivious to US involvement until the end, revealing documents published by AP illustrate just how utterly engineered the movement was, with psychological profiles of prominent members examined and with strategies, agendas, and objectives all determined from the top down by USAID and its contractors. Meeting minutes reveal overt attempts to manipulate individuals USAID sought to bring into their engineered opposition movement with meeting titles and talking points including, "What would motivate them to do what we ask?" 5. Despite lofty claims of "promoting democracy," US programs are manipulative, insidious, dishonest, exploitative, and deceitful - not only to those drawn into the program, but also both the general population subjected to it in the targeted country and the global audience lied to about the true genesis of such movements when they finally do gain traction. March 6, 2012 (LD) - Confounding was the Australian's (newspaper) recent op-ed titled, "Death of a ruthless autocrat," in regards to the late Hugo Chavez. Confounding not for the op-ed's condemnation of socialist policies or its criticism of Hugo Chavez, an obstruction to Western corporate-financier interests in South America for over a decade, but because of the obscene hypocrisy displayed throughout, from a newspaper and a corporate-financier-academic establishment in Australia that coddles a figure in nearby Thailand that is every bit as guilty of everything it accuses Chavez of. 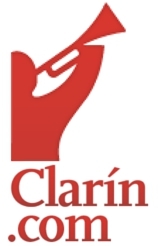 Wall Street-owned media group "Clarín" spearheading anti-government drive in South America's Argentina. 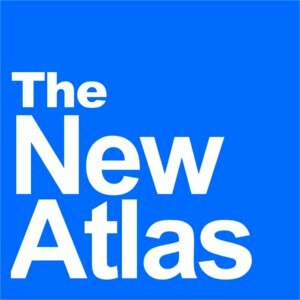 The US-engineered "Arab Spring" brought us the "April 6 Youth Movement" in Egypt, run by Wall Street-backed Mohammed ElBaradei in coordination with the Muslim Brotherhood, the "February 17 Revolution," consisting of Al Qaeda terrorists of the Libyan Islamic Fighting Group in Libya, and now Argentina has the "8N," or "November 8" movement working in coordination with foreign-owned Argentinian media group, "Clarín." Clarin has been enthusiastically supporting the protesters and laying the rhetorical groundwork justifying their street presence. Word of the demonstration spread through social networks. Many organisers remain anonymous, but Mariana Torres, administrator of the Facebook page El Anti-K, one of the most active in calling for the rally, said she was delighted: "It was a true feast for democracy." Banners and chants also took aim at recent corruption cases and Fernández's efforts to limit the power of big newspaper and TV conglomerates. Clarín, the country's most powerful media group, has stepped up its criticism of the government before the introduction on 7 December of a law that will weaken its empire. Suspicion grows as Western criticism of Argentina's nationalization and rebuffing of "rules of global finance" sharpens in tandem with street protests. Western media agencies have begun enthusiastically covering demonstrations in Argentina's capital, Buenos Aires. CNN, AP, and the BBC have all covered the protests in equally vague terms, failing to identify the leaders and opposition groups behind them, while BBC in particular recycled "Arab Spring" rhetoric claiming that, "opposition activists used social networks to mobilise the march, which they said was one of the biggest anti-government protests in a decade." 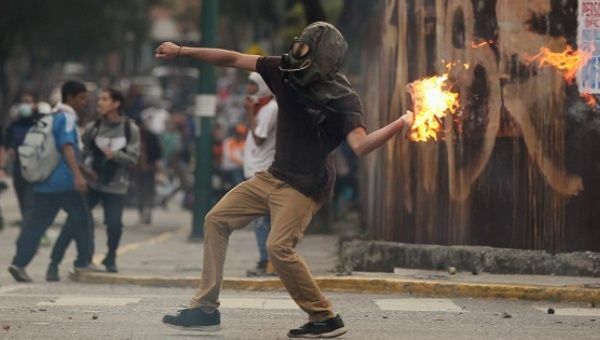 The Western media claims the protesters are angry over, "rising inflation, high levels of crime and high-profile corruption cases," all the identical, vague grievances brought into the streets by Wall Street-backed opposition groups in Venezuela. Underneath these unsubstantiated claims, lies the International Monetary Fund, and threats of sanctions aimed at Argentina's turning away from the US Dollar and the Wall Street-London dominated international financial order. And like in Venezuela, a coordinated campaign against the Argentinian government, led by President Cristina Fernandez de Kirchne, has begun in op-eds across the Western media. What a shame to see a country of such great economic promise swerving off the road to prosperity again. The latest in a history of unforced errors began in 2007. National elections ushered in populist President Cristina Fernandez, who has led her nation to the brink of disaster by refusing to play by the rules of global finance. She restricted international trade, violated contracts and pumped out phony data to disguise the soaring inflation her policies brought about. All the while she scored cheap political points by blasting the rich countries of the north for their supposed economic imperialism. Argentina took a grave step in May when it nationalized YPF, its main energy company. The takeover, condemned around the world, forced out Spain's Grupo Repsol, which owned a majority stake in YPF. Repsol was providing the engineering know-how and financial investment to develop Argentina's massive energy reserves—including the huge Vaca Muerta oil-and-gas find. Negotiations to compensate Repsol for Argentina's asset-grab will end badly for Argentina. 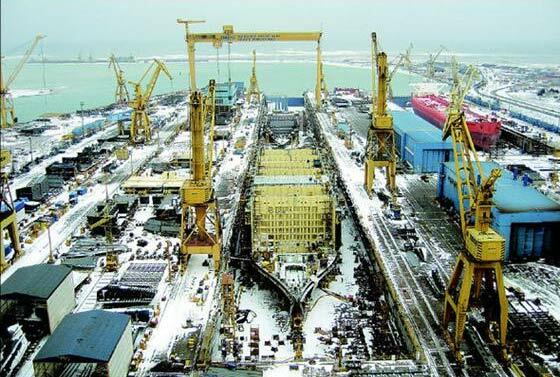 The European Union is likely to impose sanctions. Repsol wants $10 billion, and it has sent the message to rival energy companies that it will not permit others to profit from its confiscated assets. Argentina will have a hard time finding partners to help it develop what should be a lucrative resource. The financial coup against Repsol won strong national support. The approval ratings of Fernandez temporarily shot up. Even opposition parties backed the move. Government officials talked about how they had restored Argentina's dignity by standing up to foreigners exploiting its natural bounty. Meantime, Fernandez kept the once-hot economy going by nationalizing private pension funds, redirecting the money into housing loans, and expanding welfare programs by decree. Now Argentina has to pay the price. 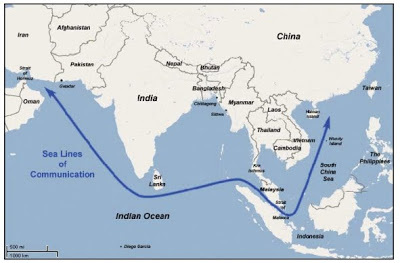 What is likely to follow will be coordinated attacks including sanctions, isolation, political attacks, currency attacks, and of course US-engineered unrest in the streets, which can range from protesters merely clogging traffic, to escalating violence triggered by the now notorious "mystery gunmen" used in US unconventional warfare to destabilize, divide, and destroy nations. But also like in Venezuela, if enough awareness can be raised in regards to what the West is doing, and the disingenuous intentions and interests driving opposition groups into the streets, these efforts being used to coerce Argentina back into the Western dominated "world order" articulated by US think-tank policy makers like Robert Kagan as serving "the needs of the United States and its allies, which constructed it," can ultimately be thwarted. 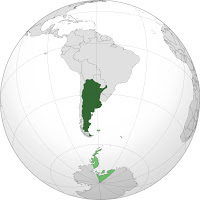 If you are in Argentina, or are familiar with the opposition groups now demonstrating against the Argentinian government, with knowledge of their leaders, demands, ideology, and affiliations, please contact the Land Destroyer Report at cartalucci@gmail.com. Venezuela goes to the polls this Sunday in an election many are calling a referendum on President Chavez and his policies. Although there is surely such a dimension, the significance of the elections goes far beyond political opinion and partisan bickering, striking at the heart of the Venezuelan state. This is because these elections will be used as a front for an attempt to overthrow, by brute force if necessary, the democratically elected government and put in its place a government more amenable to US interests. If this sounds familiar, it should. This is precisely the same tactic tried in 2002 in a US-instigated coup that, though it briefly deposed Chavez, ultimately failed. Now, ten years later, the US imperialist ruling class is prepared to try their hand at regime change in Venezuela once more. Sunday’s election presents the ideal opportunity for US intelligence to instigate some kind of coup or “color” revolution in Venezuela. However, in order to achieve this insidious goal, there are very specific strategies, tactics, and contingencies which must be understood. 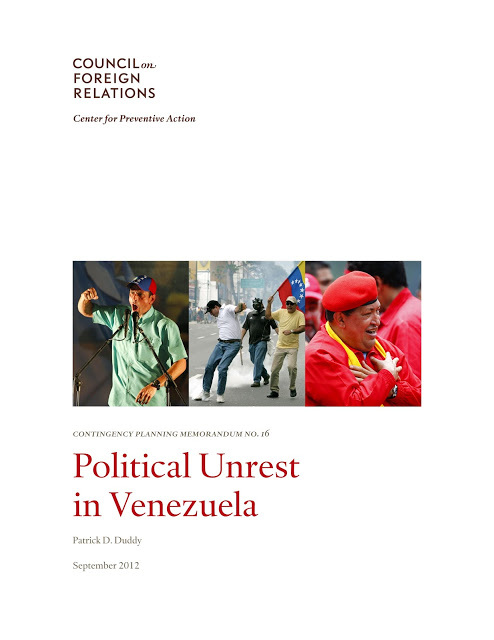 In his paper, published by the Council on Foreign Relations, former US Ambassador to Venezuela Patrick Duddy presents a number of scenarios in which the election becomes the centerpiece of a destabilization campaign. Perhaps the most important of these scenarios, one which would be in keeping with the tradition of “color” revolutions all over the world, is the outbreak of violence in the hours after the winner is announced. Duddy writes, “most plausible scenarios for instability and conflict in Venezuela derive from the premise that the Chavistas will not willingly surrender power and would be willing to provoke violence, orchestrate civil unrest, or engage in various forms of armed resistance to avoid doing so.” Naturally, Duddy fails to explain for whom such a scenario would be deemed “plausible”. Because of the nature of the paper and the author, it is fair to assume that he is referring to the US intelligence community for whom this is “plausible”. Of course, this assertion is made with no precedent of historical evidence of Chavistas engaging in such behavior. Rather, this is precisely the type of unrest fomented by the United States in the service of regime change. 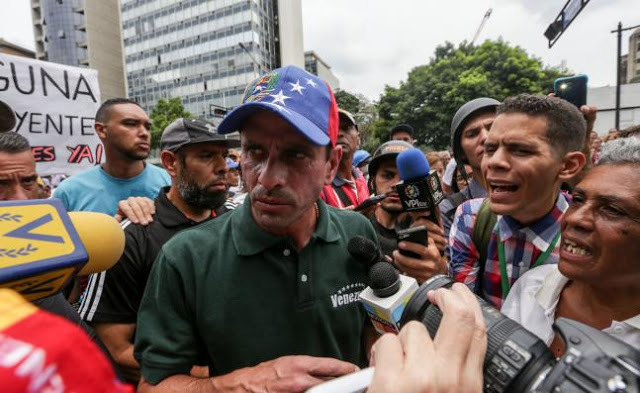 Rigged polling, coordinated Western propaganda campaign, and open conspiracy to install Henrique Capriles Radonski as head of new Western client-regime. Image: CFR's "Center for Preventative Action's" Contingency Planning Memo #6 is in reality a blueprint for meddling in Venezuela's elections and providing a framework to further undermine the government of President Hugo Chavez should he win another term in office. The .pdf can be found archived here. 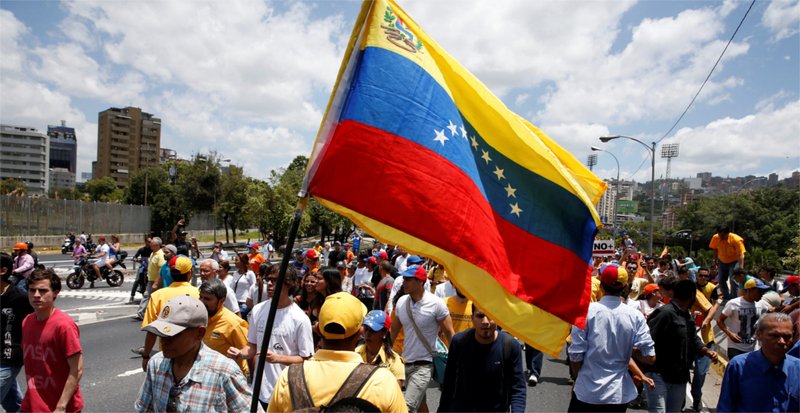 In the coming months, Venezuela could experience significant political unrest and violence that lead to the further curtailment of democracy in the country. 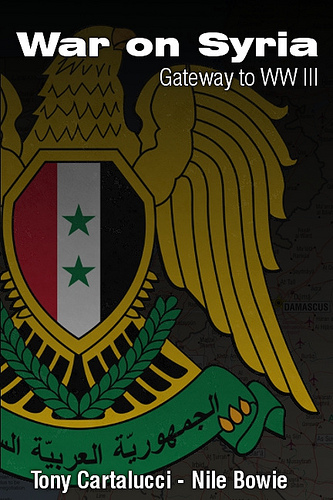 Presidential elections are scheduled to take place on October 7, 2012. 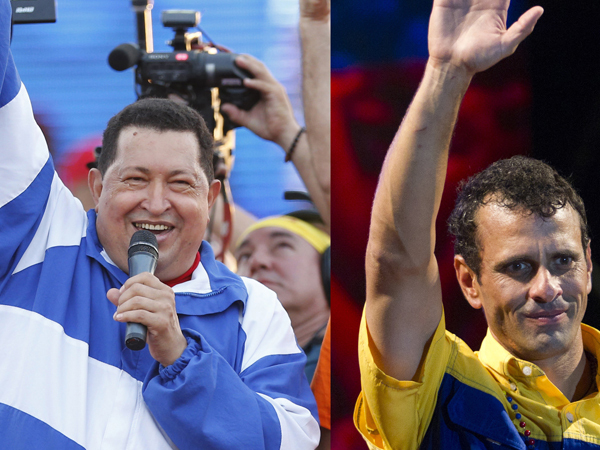 President Hugo Chavez is in the midst of a tough reelection campaign against Henrique Capriles Radonski—the young and energetic governor of the state of Miranda––who enjoys multiparty support and appears to have a better chance of defeating the incumbent than earlier challengers. 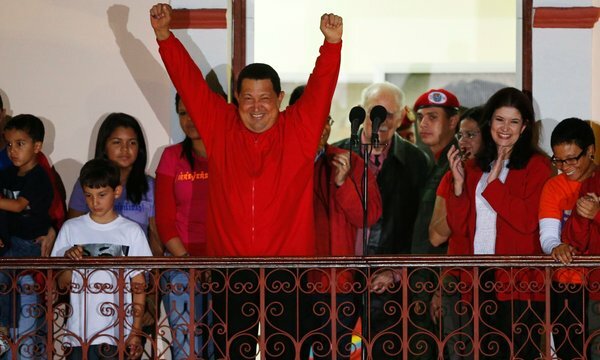 Over the course of the past year, Chavez and several of his most senior associates have asserted that there will be instability and violence if he is not reelected. At the same time, Chavez is battling cancer, but he has shared little information with the public about the state of his health beyond the fact that he has twice been treated for the disease since spring 2011. Speculation about Chavez’s health problems has generated considerable uncertainty among his supporters, especially since he has not anointed a successor. 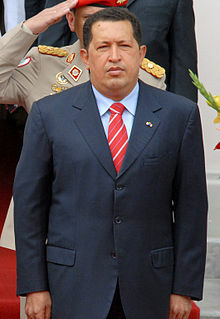 Should Chavez appear to be losing the election, die suddenly, or withdraw from public life for health reasons, tensions are likely to rise in Venezuela, especially if the public suspects that Chavez has used extra-constitutional means to preclude or invalidate an opposition victory in order to sustain his regime’s hold on power. Protests over such actions, which could turn violent, may in turn lead to the imposition of martial law and the further curtailment of democratic rights in Venezuela. This would almost certainly trigger a major political crisis in the Western Hemisphere that pits countries seeking to restore democracy and the rule of law in Venezuela—including the United States—against those who support Chavez and the principle of noninterference in the internal affairs of other states. Longstanding U.S. efforts to promote good governance in Latin America as well as cooperation on a range of political, economic, and security challenges in the region would be threatened as a consequence. The above scenario is one that has been repeated by the United States in nation after nation, from Eastern Europe, to Southeast Asia, across the Arab World during the US-engineered "Arab Spring," and already once in Venezuela itself in 2002, when similar rhetoric served as cover for the attempted but failed violent overthrow of Hugo Chavez' elected government. Ironic indeed that one of the many co-conspirators involved in the US-backed 2002 coup attempt against Hugo Chavez' government, is the current candidate running against him this year for the Venezuelan presidency. Indeed, Henrique Capriles Radonski was arrested and implicated numerous times for his role during the 2002 orchestrated unrest, the same unrest the CFR predicts will rack the country this year should their proxy candidate not smoothly enter into office. In 2002, as mayor of Baruta, Radonski failed to protect the Cuban embassy located within his jurisdiction, and his police even arrested President Chavez' Interior Minister, Ramon Rodriguez Chacin. Now, the West is attempting to lay the groundwork for a repeat performance. The rhetoric under which overt, most likely armed violence will be carried out, hinges on a singular, very predictable talking point permeating the Western corporate media - that is, that twice elected Venezuelan President Hugo Chavez will lose upcoming elections and plans on "stealing them."